You Think Politics is Brutal Now? I would be very interested to know what the weather was like in Washington, DC on Thursday, May 22, 1856. It had been an unusually long winter across the Midwest and Eastern seaboard of the United States that year. The capital itself had seen remarkably cold temperatures and above-average snowfall, followed by cold rains lasting well into May. But that happened after May 22 and further north than Washington, which is the day and place I’m wondering about. So, not having any more information than what I’ve just shared, I’ll assume it was probably an unusually cool but mild day in on the eve of the aforementioned heatwave. The reason for my curiosity is that I’m trying to imagine the scene at the Pennsylvania Avenue entrance on the west side of the Capitol grounds that day. 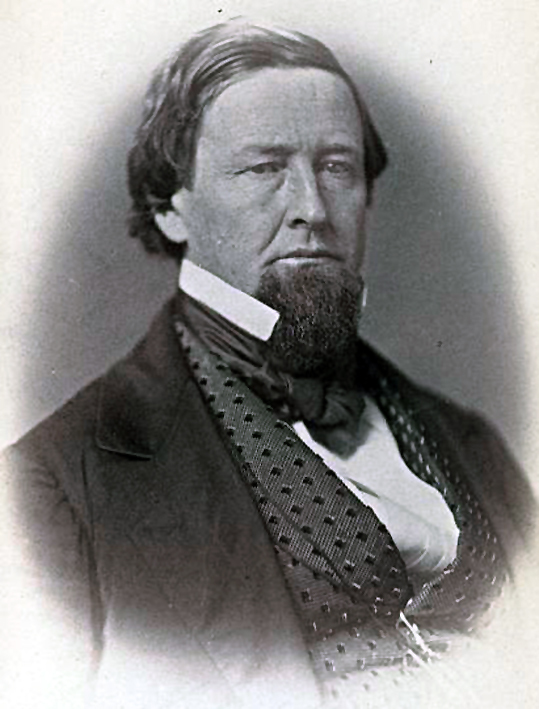 That morning, South Carolina Congressman and Democrat Preston Brooks encountered his House of Representatives colleague Henry Alonzo Edmundson from the state of Virginia and also a Democrat as he stood there viewing the Capitol. He had chosen that spot for a very specific reason: it had a commanding view of all the entranceways to the Capitol that one particular man would use as he came from his place of residence. 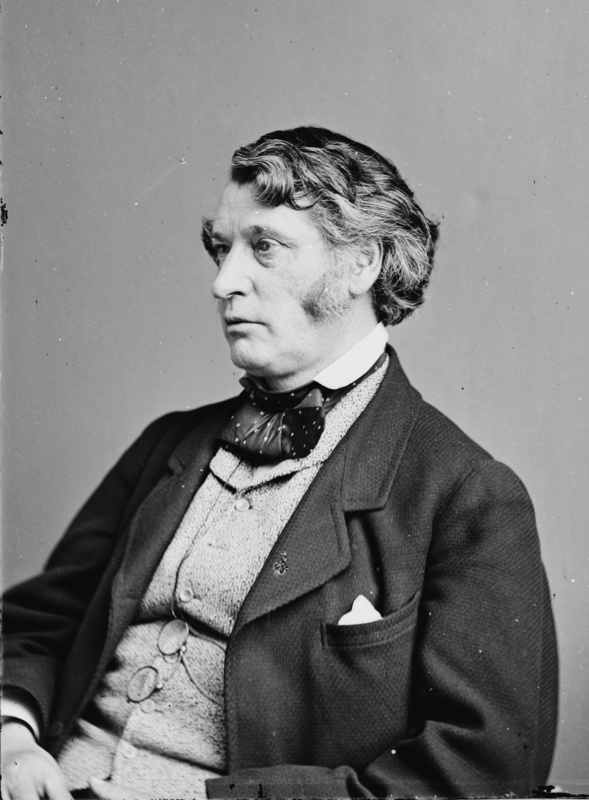 That man was Senator Charles Sumner, a member of the recently-founded Republican party,2 from Massachusetts. Brooks had a bone to pick with him, and he shared with Edmundson his intention to confront Sumner about it. The account of the destruction of the Free-State Hotel provides a bit of comic relief. Jones’s gang began by trying to use its own cannon. The first ball went completely over the roof, at which all the people cheered, much to the disgust of Jones. The next shot hit the walls but did little damage. After bombarding away with little or no effect till it was becoming monotonous, they attempted to blow up the building with a keg of powder. But this only made a big noise and a big smoke, and did not do much towards demolishing the house. Between the burning of the hotel and the burning of Robinson’s house, Jones’s mob ransacked the town. 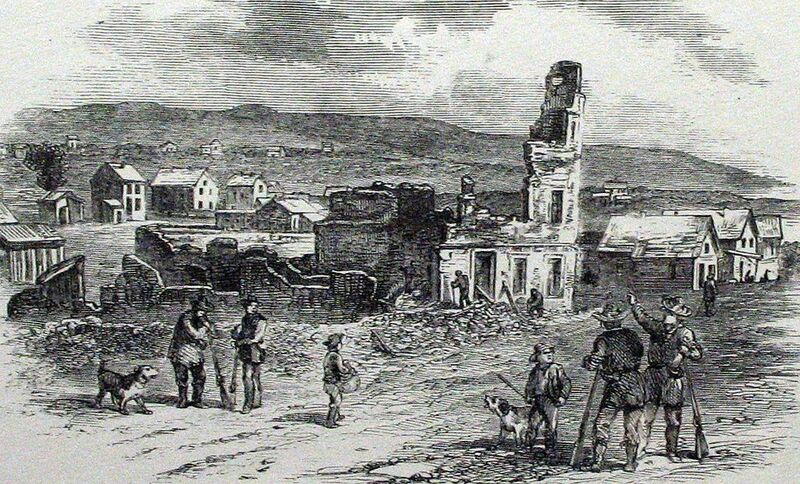 Ruins of Free-State Hotel after Sacking of Lawrence. Image from State Historical Society of Missouri. It was events like this that inspired the phrase “Bleeding Kansas,” which was popularized by New York Tribune editor Horace Greeley. 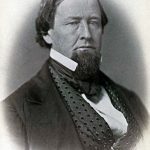 The violence began with the signing of the Kansas-Nebraska Act into law by Democrat President Franklin D. Pierce on May 30, 1854 and lasted right up to the Civil War—and even before it reached Kansas, the violence had already spilled over into Congress itself. 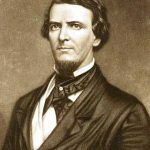 And now, two years later, on May 22, 1856, that same Henry Alonzo Edmundson was accompanying his friend and fellow Southerner Preston Brooks, who was waiting for Senator Charles Sumner of Massachusetts leave the Senate chamber and emerge from the Capitol Building. What Brooks was contemplating in very deliberate fashion was not much prettier than what Edmundson had been prevented from doing two years earlier. Brooks was absolutely furious at Sumner. Sumner’s language was not intended as purely metaphorical. By using the word “harlot” he had a more personal reference in mind. So, in keeping with the anti-slavery rhetoric of the day, Sumner was implying not only that slavery was Butler’s “harlot” in a metaphorical sense, but that it supplied Butler with his own personal harlots. At least that’s the way one member of the audience took it. 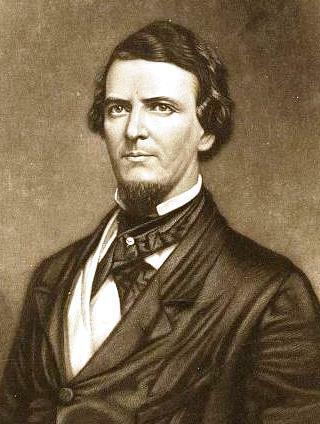 Congressman Preston Brooks later testified that he was in the audience that day, and the general rhetoric of the speech no doubt incensed him as a Southerner. But what enraged Brooks all the more was what Sumner implied about Andrew Butler, because Butler was his father’s first cousin. Brooks spent the night of May 21 with his friend, South Carolina Congressman and Democrat Laurence M. Keitt, plotting his move. Most of the Senators left the Senate chamber, a few only remaining. Mr. Sumner continued in his seat engaged in writing. Mr. Brooks approached, and, addressing a few words to him, immediately commenced the attack by inflicting blows upon his bare head, whilst he was in a sitting posture, with a large and heavy cane. Stunned and blinded by the first blow, and confined by his chair and desk, Mr. Sumner made several ineffectual efforts to rise, and finally succeeded by wrenching his desk from its fastenings. 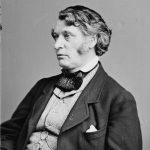 The blows were repeated by Mr. Brooks with great rapidity and extreme violence, while Mr. Sumner, almost unconscious, made further efforts of self-defence, until he fell to the floor under the attack, bleeding and powerless. Brooks nearly killed Sumner that day. The attack was so vicious and brutal that Sumner would not be able to perform his Senate duties again for three years. He attempted to return the following year, but it appears he was suffering from what we now call Post-Traumatic Stress Disorder (PTSD). “Southerners charged he was shamming for publicity’s sake,”16 but he became an overnight hero for the anti-slavery cause in the North. The phrase “Bleeding Kansas” became twinned with “Bleeding Sumner” in the 1856 election cycle. 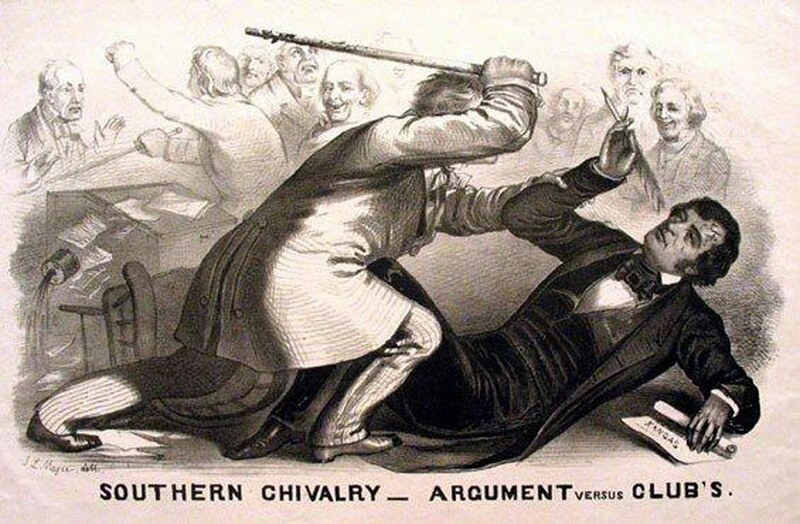 Anonymous lithograph cartoon of Preston Brooks caning Charles Sumner, based on a lithograph by New York Artist John L. Magee (1856). 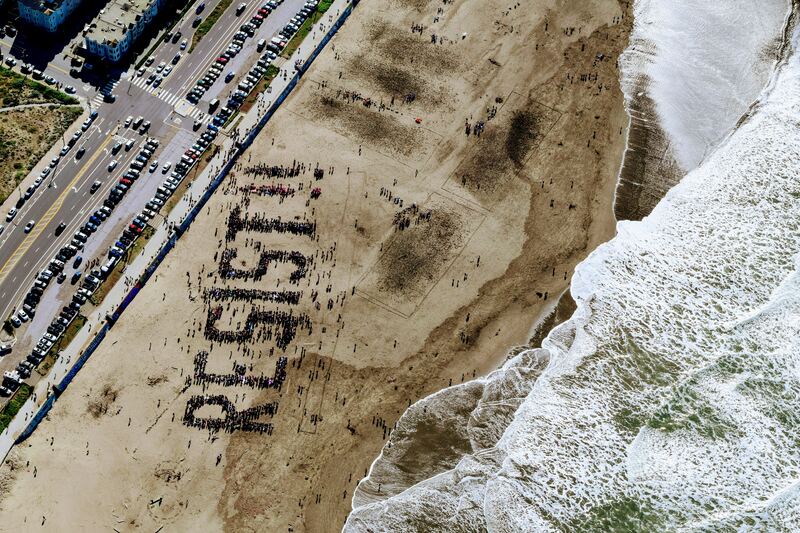 Neither side appeared to be listening to the other anymore. At the highest level of American government, rational debate and political compromise had been replaced by diatribes, and diatribes were greeted with brandished weapons and flying canes. “The nation, suffering from the breakdown of reasoned discourse that this event symbolized, tumbled onward toward the catastrophe of civil war.”20 And it was a war that would cost the lives of 600,000 people. The Worst It’s Ever Been? Whenever anyone begins a sentence with the words, “A study has found,” as if that study has supplied the definitive word on whatever we’re discussing, my immediate reaction is to either (a) stop listening, (b) laugh uproariously, or (c) leave the conversation. I’m sure there are a lot of good academic studies out there, but if there’s one thing we’ve learned about them is that if you wait a few minutes the one you’re reading will be contradicted by another one. Seriously? We’re supposed to believe that the divide specifically between the Democrats and Republicans is the worst it’s ever been? Did I miss a recent headline or two? Did our Congressmen, assembled on the House floor, recently brandish Glocks and point them at each other and it somehow escaped the notice of CNN, MSNBC, and Fox? Did one of our elected federal legislators pummel another legislator to within an inch of his life and that news was passed over in favor of a story about Kim Kardashian? I know things have gotten vicious this year, but I don’t recall anything of that sort reaching the level of the period in American history that began with the Compromise of 1850 and lasted through the end of the Civil War. Now, perhaps I shouldn’t be so hard on the Study Finds web site, since it’s simply paraphrasing the title from the Michigan State University web site that earlier reported on the study. That title reads, “Democrat/Republican Divide Is Worst It’s Ever Been.”22 The fact that this is being declared on a page owned by a major American university is a specimen of academic malfeasance that beggars description. Even worse than all this, however, is the fact that neither the title nor the abstract of the study supports the conclusion of either the MSU or Study Finds web sites. The study is titled, “A sign of the times? Weak and strong polarization in the U.S. Congress, 1973–2016,”23 by Zachary Neal, who is, coincidentally, not an historian, but an associate professor of psychology and global urban studies at Michigan State University. So, how does the web site of a major university and a web site that specializes in reporting on academic studies conclude that a study on American political division dating back to 1973 informs us of how bad those divisions were going back to the founding of the Republic, or at least as far back as the founding of the Democrat and Republican parties? This could only happen if neither web site editor bothered to read the study’s title or they both have a very definition of the word “ever” than is found in English dictionaries. Of course, we all know what will happen. Over the coming weeks and months, countless users of social media will see the Study Finds web page, and perhaps even the MSU web page, copy the URL into a tweet or Facebook comment, and ensure the dissemination of one of the most ridiculously ignorant statements ever made about both historic and contemporary American politics, all with the appearance of official academic certification—as if that counts for as much as most people think it does. Praise God. This is excellent and you have the pre-1973 historical facts, etc. to back them up. Thank you both for keeping biblical and historical TRUTH out front. This article is well written and well cited. It’s a glowing example of exactly why the left does not want their history taught to our children.